We are glad to announce the preview of Azure Data Factory (ADF) Copy Wizard for interactive and “code free” data movement experience. Data is the raw material for analytics and our goal is to allow moving diverse data (structure, unstructured, small, big, etc.) to and from Azure in a friction free, performant and reliable manner. With this release customers can easily move data between Azure BlobStorage, Azure SQL, Azure SQL DW, Azure Data Lake and On-Premises SQL Server using a simple and code free wizard. This is the first milestone and over the next few weeks, we are going to evolve this experience and enable all the existing 20+ connectors that are supported by ADF today. We are targeting to address the requirements for both Data Scientists to upload sample data into Azure for experimentation and Data Developers to orchestrate data movement on a cadence for business critical tasks such as loading an enterprise’s Data Lake or Data Warehouse, or performing predictive analytics in the cloud at scale. Check out some of the exciting features we enabled in this release. 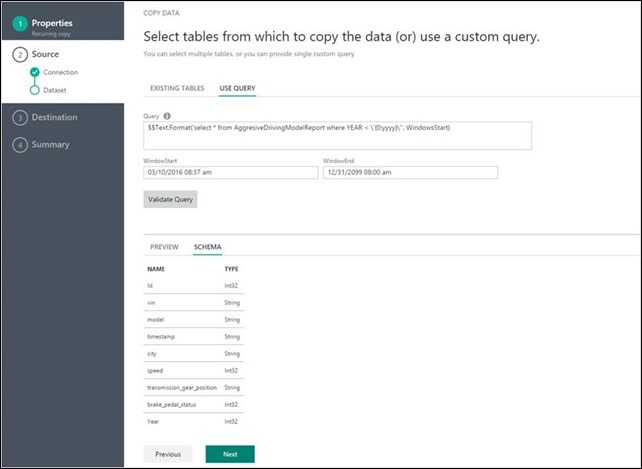 See a quick example of how to use the Copy Wizard to quickly set up a data movement pipeline that moves data from an on-premises SQL Server to Azure SQL Data warehouse. Validate expressions: Leverage ADF activity window system variables in custom queries and validate before deploying. Learn more about ADF system variables here and see the example below. The experience is designed with big data in mind from the start. Moving hundreds of folders, files or tables is simple and seamless to author. Out of box support for both one-time and scheduled copy operations. Both of these options can be used for the breadth of the connectors across on-premises, cloud and local desktop copy. One-time copy enables data movement from a source to a destination just once and applies to data of any size and any supported formats. The scheduled copy enables copying data on a prescribed recurrence. Users can leverage rich settings (like retry, timeout, alerts etc.) to configure the scheduled copy. Launch the Copy Wizard from the ADF summary blade in the Azure portal by creating a new or using an existing data factory. 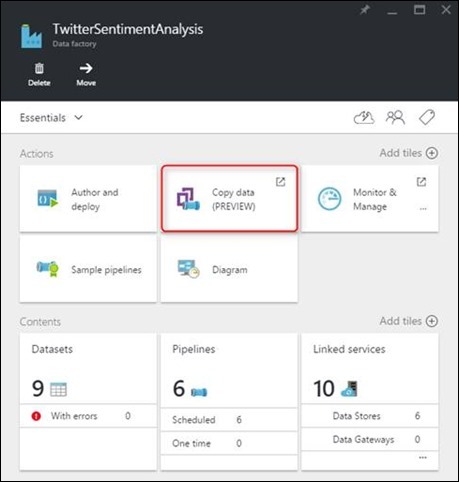 Then click the “Copy data” tile on the summary blade to launch the app. Check out our documentation for a step-by-step tutorial on using the Copy Wizard. We are working continuously to evolve and improve this experience for all existing and upcoming connectors. Please try it out and provide feedback via Azure Data Factory Feedback Forum.